Mac OS X 10.10.3 introduced version 1.0 of Photos.app, Apple’s iCloud Photo Library enabled replacement for iPhoto and Aperture. Over the past couple of weeks, having finally uploaded my 120GB of photos and videos into iCloud Photo Library, I’ve had the opportunity to begin exploring the new application, and much of that time has been spent in “Faces”—the area of the application that allows you to associate photos to people. I previously documented some sync issues related to faces, and in today’s article I’ll highlight some face management issues. The short region at the bottom displays a row of “Suggested Faces” that Photos has auto-detected. 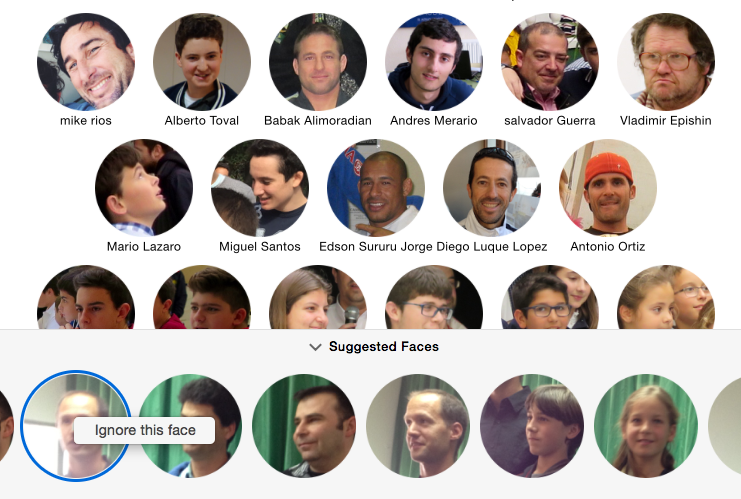 Double-clicking any of these faces triggers a search/input field to assign a name to that particular face. Control-clicking on any of these faces allows you to instruct Photos to “ignore” the face, removing it from the Suggested Face row. In my Photos app, “Suggested Faces” currently contains far more images I want to ignore, than images I want to tag. Unfortunately, Photos does not allow you to “ignore” multiple faces at once, hence requiring you to control-click-ignore faces one by one by one. Since ignoring faces has become unworkable, my next approach was to scroll along horizontally, finding and adding those faces I do want to tag. But what’s equally frustrating, is that when I do tag a face, the Suggested Faces scroll snaps back to the start of the row—thereby losing my scroll position! The inability to ignore multiple faces at once, combined with the loss of my scroll position when looking for faces I do want to tag have become show-stoppers in my use of “Suggested Faces”. There’s no way to filter the upper region of faces. If you want to change the key photo for a particular face, or correct a face assignment mistake, you have to either visually hunt for the face in question or use the app’s general search mechanism to find the person, and then make the edit in an environment different than that optimized for face management. When viewing an album of photos, I haven’t found a way to enter the Faces management mode, scoped to just those photos. This was possible in Aperture. So within the context of an album, you have to manually identify and name each face. When associating a Suggested Face to a known existing person, Photos will often display several other photos it believes contains the same face, allowing you to add (or exclude) those in batch. I expected to find this feature available in the screen you’re shown when double-clicking on an existing person in the upper region of the Faces area, but alas, it isn’t. Currently, Photos knows of several photos containing my son, but I can’t confirm those until I find him being proposed for management in the Suggested Faces list. I had hoped that setting the key-image of a person associated with one of my Contacts, to update the image used for that person in Contacts, but that doesn’t seem to happen. If I work in the Faces management area for an extended period of time, I begin notice the program slowing down. For example, I begin to experience noticeable delays when typing into the search/input field, having double-clicked a face. So it appears there’s some room for performance improvement in the app as well. One of the photos the app identified in Suggested Faces was the cover of the Steve Jobs biography. For a moment, I found myself surprised that Photos didn’t auto-recognize that particular face! As someone currently building a version 1.0 of a new product, I can deeply sympathize with the need to prioritize features, and release something closer to an MVP. In this respect, I think Apple has done an astounding job with the initial release of Photos. That said, at least in the area of Faces management, there are some important deficiencies that need addressing, and I look forward to those receiving some attention from Apple in future updates. In anticipation of Apple’s Q2 earnings call on April 27, 2015, Fortune published some predictions of both professional and indie analysts. Will be interesting to check back here after the 27th to see how they did. So the prediction winner is, indie analyst Robert Paul Leitao. My favorite analyst, Horace Dediu, underestimated the number by 9%. This morning, in a post discussing my first impressions of iCloud Photo Library, I mentioned a concern about the synchronization of Faces data, which I’d like to discuss in more detail here. As background, for many years I organized my growing collection of photos in an Aperture Library, and during recent years had associated many of those photos to individuals using Aperture’s face recognition technology. In anticipation of iCloud Photos Library, I wondered how I would upload 90GB of Aperture data (photos only, not including video!) to Apple’s cloud within a reasonable amount of time. The best location from which to to seed my iCloud Photo Library would certainly be my internet-hosted Mac mini, with its 100 Mbit connection. To support that, the great staff at Mac Mini Vault allowed me to ship them a thumb drive containing my data, which upon arrival they connected to the machine, allowing me to then copy my Aperture Library to the local drive, from where it would then get imported into Photos and uploaded to iCloud Photo Library. It took about four or five days to seed my library with the 90GB of data from Photos running on the Mac mini. And a few days after that, all that data—photos, albums, etc.—began appearing on my iPhone, my iPad, and within the Photos app on my MacBook Air. What was missing, however, was my faces meta data. Viewing Photos on the Mac mini (via Screen Sharing), I could see that all the faces data I compiled over the years did make its way into that initial import from Aperture. But that data wasn’t getting synchronized to my MacBook Air, where I needed it. On Twitter, Thomas Verschoren pointed me to this Apple Support article which explicitly says that Faces data does not synchronize across Macs. That in itself is terribly, terribly disappointing because being able to find old photos of specific individuals was very important to me. As you can see from this image, a search on my daughter’s name returns search results, that are associated with a type “Face”, and so even though the smart albums themselves haven’t synced, some level of association between the person and the photo has. On the other hand, though, looking at the information panel for one of the photos resulting from this search, the direct association of the face in the photo hasn’t synced. So the current situation is that although I’m able to find all the photos that were associated with a person through Aperture’s face recognition process, that native relationship defined in Aperture hasn’t synced between Photos on my Mac mini and MacBook Air. I’ve got my fingers crossed that Apple will fully close this loop in some future update. I shipped my 90GB Aperture library to the provider of my internet-hosted Mac mini, on a thumb drive, in order to seed iCloud Photo Library from a computer with a fat pipe. Even still, it took several days for all the data to upload to Apple. But it all finally did, and without getting stuck. I’m glad I skipped the betas and waited for the final release. It was interesting to see that all the data was uploaded to Amazon S3. My family love having all our photos and videos in one place now, and are constantly gathered around my MacBook Air—especially watch the videos. Given that I’ve setup an iCloud Family plan, I presume Apple will at some point provide a mechanism to provide family members with access to one’s iCloud Photo Library. Since family member access doesn’t currently exist, I expected the next best thing would be the AppleTV. But we discovered that the iCloud Photos app on our second generation AppleTV doesn’t provide access to the library, just the “Photo Stream” and shared albums. Since the second-generation AppleTV isn’t receiving updates any longer, I went purchased the latest model AppleTV, but was disappointed to find that its iCloud Photos app also doesn’t provide access to the entire library. The AppleTV would be the perfect channel through which a family can enjoy its media, but I’m wondering if Apple are holding off on this (maybe due to bandwidth costs?) In any case, I’ll be returning this AppleTV, as rumors are a new one will be released soon. Although I have “Optimize Library” set on all my devices and my MacBook Air, I think I’m going to allow a full copy of the data to remain on my Mac mini, so that at least I have one backup of all my data at CrashPlan. It’d be kind of scary to imagine that the entirety of my photos and videos only exists in Apple’s storage. Non-destructive photo editing that propagates to other devices is magic. When editing photos, I seemed to have gotten Photos in a mode where it would apply auto-enhance whenever I simply cropped a photo. Apple have a couple of issues to work out with sharing. When sharing photos to Flickr, you can choose an Album in which to publish, but you can’t create a new one. I always publish to a new album, so that’s a real pain currently. And when sharing multiple photos to Facebook, rather than including all the photos in single post (like a gallery), each photo ends up in its own independent post with a copy of the description. Apple still have some conceptual clean-up to do. Currently I need to put videos in Photos on the Mac, but on iOS devices I watch them in Photos instead of Videos. And “Photo Stream”? How does that fit into the picture any more? Above all, iCloud Photo Library, and Photos on Mac and iOS seem to be a great start to how photos and video management and experience should work. Despite some initial issues that are not-so-ideal, Apple definitely seem to be on the right path. The other state in which I might find the device is Disabled. This is the state the device gets in after too many failed logins. And if “Find my iPad” was previously enabled, you can’t recover from this mode through normal means. For example, if you try “Restoring from Backup”, iTunes will report that you must first unlock the device with your pin code—something that’s obviously impossible to do. Furthermore, logging into iCloud and removing the device from “Find my iPad” doesn’t help either. When the device is disabled, you have to boot in Recovery Mode—by pressing the power-home button combination until the device restarts, and then continue holding the home button until it says “Connect to iTunes”—and then restore it from scratch, from iTunes. This requires a full download of the iOS software over the internet. This—the device getting disabled—has actually happened to me twice now, and in both cases there was some mystery around its recovery. The first time, I booted into Recovery Mode, started the restore process, and went to have lunch. When I returned, expecting to find the iPad in a “new” state and requiring a restore from backup, I instead found it completely up to date, with all my apps and contents. It was as if nothing had happened. Given my certainty that I’d need to subsequently restore from backup, I actually wondered whether the restore process had happened at all, or whether the device had somehow just recovered. The second time, I was in the car and found it disabled while at a stoplight. (Yes, I was going to check email at a stoplight.) When I got home, the problem had cleared up on its own. p>This afternoon while at the office, I opened the iPad to discover it in the “Possessed” state, and decided to immediately drive over to the local Apple Store, five minutes away, to have a Genius look at it. The folks at the Apple Store, though, wouldn’t let me speak with a Genius, because I didn’t have an appointment. The problem, I explained, was that by the time I got an appointment, I would be left having to describe the problem to them, while right now, I can actually demonstrate it! Unfortunately, that wasn’t a good enough reason to break protocol, so they gave me an appointment for next Tuesday. Had my appointment at the Apple Store Genius Bar this morning, and given the combination of both a brightness anomaly and frequent “iPad is Disabled” occurrences, they replaced the iPad mini on the spot, saying that my old one almost surely had a motherboard problem. The iPhone 5S and chopped off fingers. Don’t spend $5,000 for a real Rolex, because wearing that kind of money on your wrist is likely to get your hand chopped off! Instead, spend 45 bucks on our imitation Rolex, which, we guarantee, is indistinguishable from the real thing! The obvious point this advertiser missed is that if their watch is indistinguishable from from the real thing, then you’re still just as likely to get your hand chopped off. And if that happened, it wouldn’t be that satisfying to know they only made off with $45, rather than a $5,000. You’d be thinking about your lost hand! I was reminded of this story today when I read on TUAW how a disembodied finger can’t be used to unlock the Touch ID sensor on the now iPhone 5S, since activation of the sensors requires the presence of electrical charges that wouldn’t be emitted by a severed finger. Posted on September 17, 2013 September 17, 2013 Categories TidbitsTags AppleLeave a comment on The iPhone 5S and chopped off fingers. I get a lot of email that I’m interested in reading, but which I don’t want cluttering up my inbox. In the past, I tried creating a mail rule that would immediately archive mails (keeping their status unread) with a sender address matching those within a long list contained in the rule. That got unwieldy after a while, since Mail.app’s rules definition interface wasn’t really meant for managing very long lists of conditions, and so I abandoned the rule. Recently, though, I had a better idea — adding all theses senders to a “ReadLater” group in Contacts.app, and then having my Mail.app rule contain a single condition—i.e. checking whether the sender is a member of that group. Works great, and easier to identify just those mails in my Smart Folder for later reading. Manual app updating, prior to iOS7, was beneficial to developers as a mechanism to notify their customers that a new version was available1. Since Apple doesn’t otherwise provide developers with a way to communicate directly with their customers, that indirect mechanism served an important role. in iOS 7 apps silently get updated, automatically. This morning, I just happened to wander into the App Store app and discovered several apps that had recently updated—some of which contained interesting functional additions. Perhaps with iOS7, enabling customer communication by finding creative ways of capturing user email addresses—i.e. 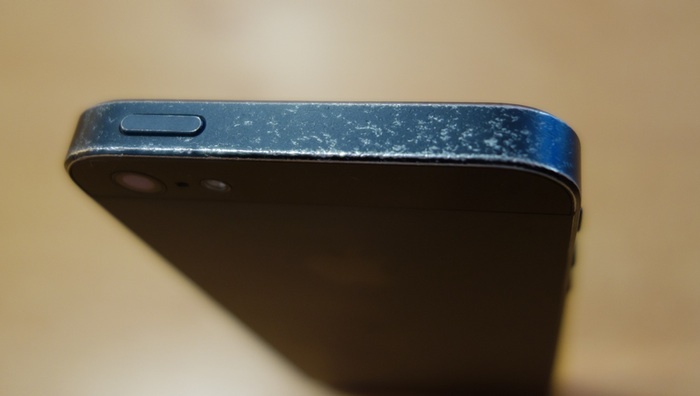 ways that don’t violate Apple’s policies—will take on a higher priority with developers. Apple’s app review process seems to get its share of knocks in the developer press, but we at Makalu recently had a positive experience which demonstrates that, at least from time to time, the process actually works. Live results publishing. Users can now publish live results online, at any time during the race. Now, the whole world can follow the event, as it unfolds. New account signup screen. In order to publish race results, the app must be logged into the user’s account. In the past, the account creation process happened upon the first publication of results. That caused problems, though, for some users, given that the account creation process happened right in the middle of timing their event. To address that, version 1.4 introduces the account creation process on first-launch of the app. After about a week of waiting, the app was rejected, with the stated reason being that the app requires the user to provide personal information (i.e. create an account) in order to access “non-account related app features”. Having recently read another developer’s blog about a rejection due to requesting the user’s email address “too early in the process”, we weren’t too surprised to see the rejection. But we were surprised by the stated reason, since it was flat-out wrong; our app does not require an account to use non-account related features. Since we urgently needed the live results publishing feature for an event at the end of this month, we were considering removing the first-launch account creation screen, but then decided to see what would happen if we responded to Apple’s feedback — simply stating that they’d made a mistake. We did that, along with making an expedited review request. To our pleasant surprise, Apple responded that they would take our feedback into account, and one day later, we got news that the app had been released from review, and was ready for sale. After a moment to catch my breath, my first thought was that forever I’ve been opening the Weather app on my iPhone, never really imagining the day would come when I could instead watch a man talking about the weather in a Flash player. Anyway, more seriously, let’s check out this ad. FIRST ad displaying more than six trademark symbols. C’mon, Matt, I said seriously. (And it needs to be taken seriously; Sprint probably paid somebody $25,000 for this ad.) Ok, here we go. First, I don’t get the usage of “FIRST”. But maybe that’s just me. Does this mean my poor iPhone can only deal with 15 of the top 100 sites? Let’s go check out the Alexa Top 100. 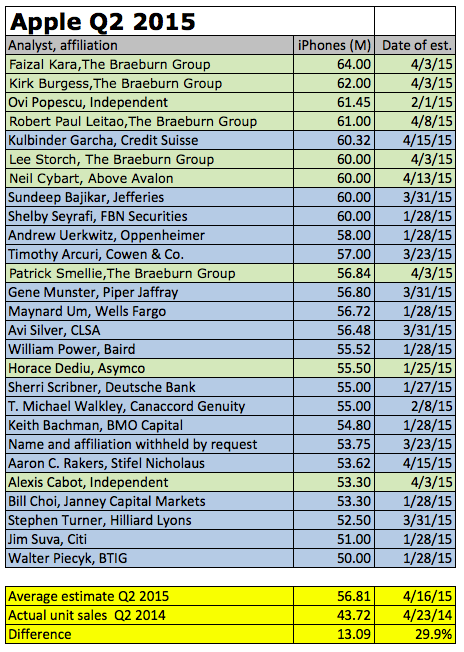 Google (seems responsible for at least 20 of the top 100). Facebook. YouTube. Yahoo. Wikipedia. Twitter. Amazon. LinkedIn. eBay. Flickr. Apple. New York Times. Hmmm — where is the Flash on these sites? Oh, I see — mostly it’s the ads. The ads on these sites are often Flash. 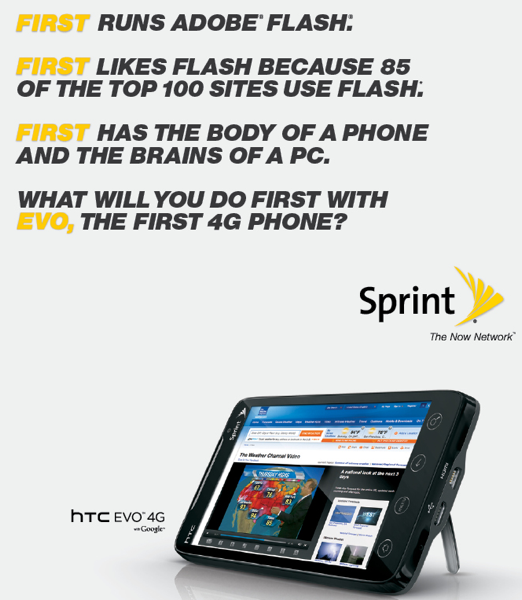 So what this ad is really saying is that if I’ll switch to a Sprint HTC EVO 4G, in addition to getting a phone with a peg leg, I’ll finally be able to see all those slide-out, content obscuring ads I’ve been missing! A couple of months ago — as it were, about three weeks before the launch of the MacBook Pro (Grrrrr) — I placed an order for two 15″ G4 Powerbooks from Apple Spain’s store. One was for me, and the other for our company’s system administrator, Niall. The idea was that I would take delivery of both, and deliver one to Niall (who lives in Ireland) on our next corresponding trip to the company home office in Germany. About three days after receiving the two Powerbooks, the display in one — Niall’s, of course — died. I called Apple’s post sales support, on a 902 number. A couple of interesting observations: (1) If you want to buy Apple equipment, a toll-free number is available for you. If you want service, however, you’ll be paying for a toll call. (2) If you call a sales number, you’ll be attended to in a split second. If you call support, plan to make some coffee. After listening to an automated voice telling me (at least 50 times) that I might be able to resolve my problem by hanging up and going to A-P-P-L-E.C-O-M, I finally was routed to a service representative, to whom I described my problem with the dead monitor. Of course, they’re trained not to take your word for it; you have to run through some tests first, on this for-pay phone call, to establish that, in fact, the display is dead. Apple: So, Mr. Henderson, you’ll need to drive to Pepe’s Computer on the other side of Malaga, and drop off the Powerbook. They’ll in turn forward it on to TecniMac in Sevilla for repair. You should have it back within three to four weeks. Me: Malaga’s more than 50 km from Marbella. In normal traffic, the drive to Pepe’s would be about 1.5 hours each way. I’d prefer to purchase AppleCare, so that a courier can pickup the device here at my office. Apple: Certainly, Mr. Henderson. I’ll process that order for you right now. Me: Whoa, whoa, whoa… Uhmm, didn’t I just purchase AppleCare to avoid that? Apple: Yes, but, you see, you live within 80 km of an authorized pickup location. So, even with AppleCare, you still have to deliver it yourself. Me: Couldn’t you have mentioned that 10 minutes ago? Look, anyway, in the US, they always send a courier pickup under AppleCare. Apple: Well, this isn’t the US. Fortunately for me, an Apple reseller just opened here in Marbella — Marbella Mac Solutions, MMS, who, after hearing my sad story, said they’d be happy to organize the repair for me. 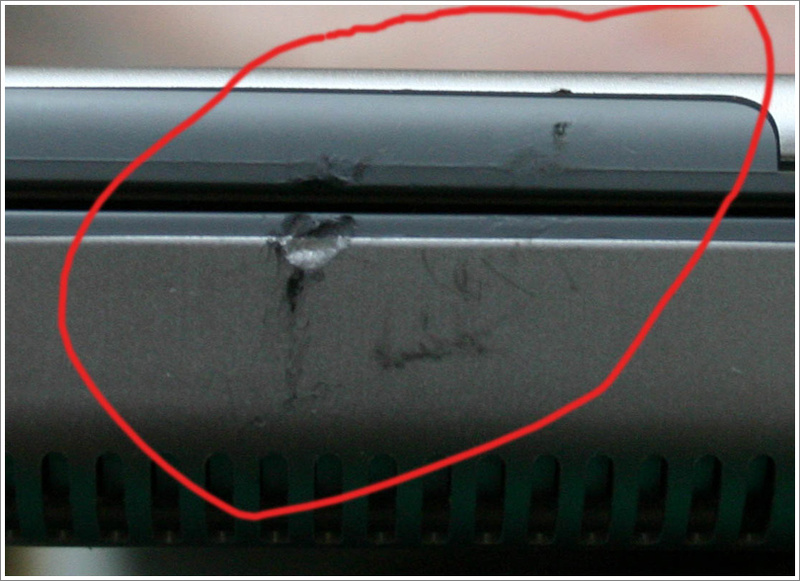 As with Pepe’s, that still involves sending the Powerbook off to TecniMac, in Sevilla — apparently the only authorized Apple repair center in this half of Spain. So, with about six weeks before the planned hook-up with Niall in Germany, I dropped the Powerbook off at MMS. Turns out, four weeks was optimistic. On the very day before my trip to Germany, I was called by MMS to let me know the Powerbook was ready for pickup. I picked up the computer about five minutes before their closing time, and headed off to Germany. Reading the repair report, TecniMac had determined that the problem was a “logic fault”, and replaced the logic board, the LCD display, and a related cable. That’s where we are today. Niall is trying to communicate with the Apple folks in Ireland, but it’s not easy. They want records of the previous repairs. They want proof that we’re really still seeing problems. In short, they’re making it as difficult as possible to get this situation sorted out. And what’s the best we can hope for? Another repair session with Apple (Ireland). Niall having to work without a Powerbook for weeks. And, in the end, owning one Frankenstein of a portable — composed of bits and pieces from here and there, likely to never quite work like a new one. 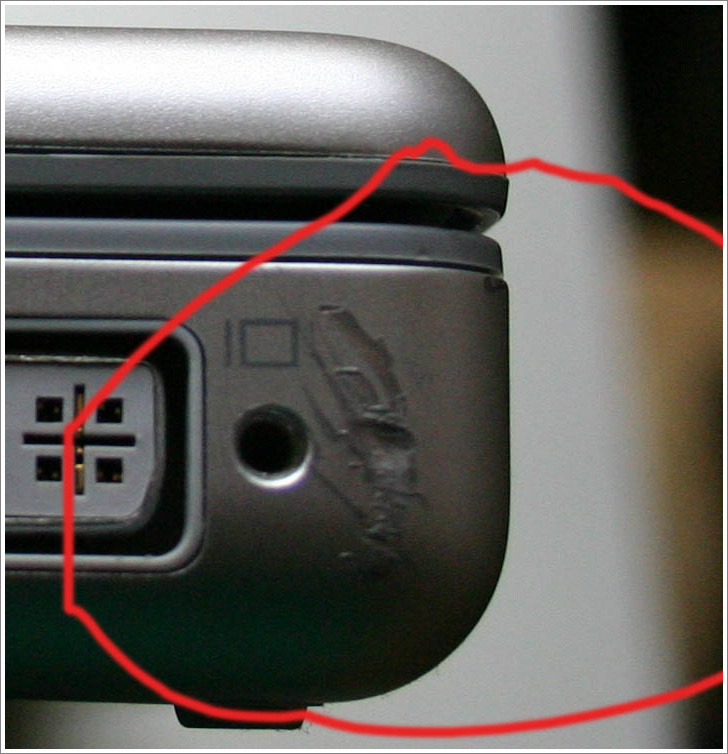 How about that?– turns out the serial number of our Powerbook corresponds to the batch of defective units listed in this article, which have been demonstrated to have a problem recognizing both memory slots. Great, in a weird way. At least you’d think that in this case, getting support would be easy — there’s an article on Apple’s very own website, listing my very own serial number. Nope. Not even in this case is it easy to get service from Apple Europe. Seems that the repair terms and conditions of the article are relevant to the US market, not Europe — even though the article appears on Spain’s support page. Once again, I’m asked to go driving off to Malaga. The support representative said he needed to check with “management” to see how to proceed, and would phone us back. A week later, we’re still waiting for the phone call. In the year 2004, I reported to Apple Europe that there was a bug in the interface between their ordering system, and their logistics system, which discarded one line of the shipping address. In my case, it cut off the line which specifies in which apartment I live. Pretty serious problem, and the source of many shipping delays. I received a reply from someone apparently high up in Apple Europe, apologizing for the problem, which he stated was a known issue he thought had been resolved several months earlier, and promising to personally look into it. Jump ahead to mid-2005, another order of mine is delayed, due to the very same problem. The point of all this is that Apple should be ashamed of their European operations, especially their post sales support service. Maybe if enough people publish their stories, someone at Apple with enough clout (and concern) to do something about it will initiate some changes, to finally demonstrate some appreciation to their loyal customers.